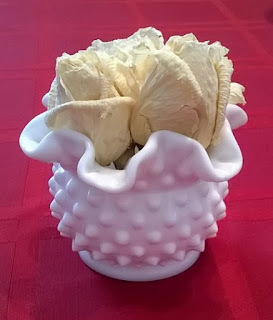 Making your own potpourri from roses couldn't be simpler. All you need are several dried rose blossoms and a few drops of rose-scented essential oil. 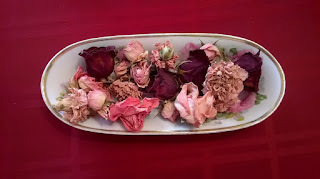 You can include dried rose leaves and stamen petals, too, if you like. The photo above shows pink and red roses displayed in an antique oval bowl. 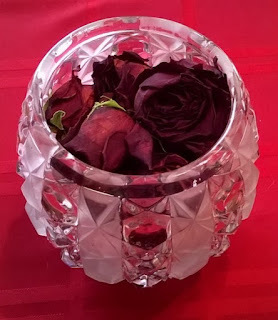 The bowl itself is decorated in a rose pattern, but the dried roses cover most of the pattern. Here's an antique cracker jar that belonged to my grandmother. Since it has a lid, it could be closed after the essential oil is added so that the scent has a chance to disperse into the dried roses. Here's the same bowl, shown from two different angles, but without the lid. 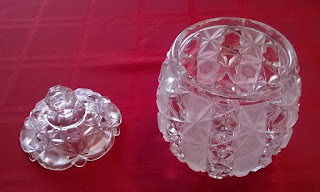 Once the roses are scented, this type of jar can be displayed either with or without the lid, depending on your preference. Here are cream roses displayed in a white hobnail bowl. Note that the roses were as white as the bowl when they were fresh. As they dry, they darken, and you end up with a cream color. If the edges of the dried petals are darker than you would like, just gently pinch them off to remove them. For this display, I used an antique etched glass vase and layered crushed rose petals and stamens in the bottom, then alternated red and cream color dried rose blossoms. To dry roses, simply let them stay in the same vase you originally used to display them. Pour out the water once they start to fade. Drying time will depend on the amount of humidity in the air. I live in the desert Southwest, and they dry very quickly here! Use the scented essential oil sparingly. Start with just a couple drops. That may be all you need for a small jar of poutpourri. Use full blossoms or crush the blossoms, leaves, and stamens. You can always use a combination of crushed and full blossoms. 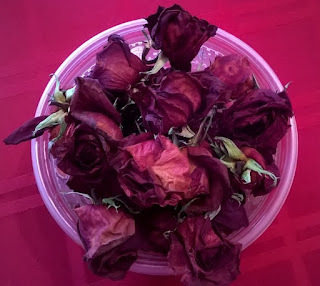 Dried buds are good additions to a crushed roses mixture to add variety. You can probably find many suitable bowls, jars, or vases, in which to display your potpourri right in your own cupboards or china cabinet. Also, thrift stores are good places to pick up some pretty glassware at a low cost.